The following individuals consented to serve as directors of Bells for Peace, Inc., a Virginia non-stock not-for-profit 501(c)(3) corporation founded on December 8, 2004. 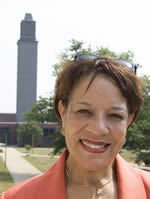 Read Watkins' Biography Alumna, Founder, Chairman of the Board and President, BELLS FOR PEACE, INC. Member of The Rotary Club of Richmond and the James River Valley Chapter of the Links Incorporated. Sheryl Ellison-Blue, Esq. Alumna and Attorney, Washington, D.C.